In early February of this year, I attended the Suburban Detroit Coin Show in Livonia, Michigan. As I walked the bourse floor, I asked each dealer if he or she had any hobo nickels (my primary numismatic interest). The answer was usually “No,” or “I haven’t seen one in 4 or 5 years.” I did find a total of 3 modern, below average carved nickels. One dealer told me he bought one just so he could show his customers what a hobo nickel is. I had just about traversed the entire bourse when I came across an unusual Buffalo nickel at one dealer’s table. 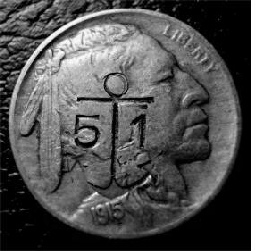 It was a beautiful 1915 Buffalo Nickel with the numbers “5 1” and an anchor impressed into both the obverse and reverse (see photos). It looked like this had been done with a hand stamp or stamps. I was sure it had been done a long time ago, perhaps in 1915, because of the AU condition of the nickel. The dealer knew nothing. He had picked it up with some other coins and exonumia from an estate. I made an offer and drove home with my acquisition. So I thought that my nickel might be some sort of commemorative of the commissioning ceremony? But this was only an educated guess. A couple of days later, I went back to the Internet again. 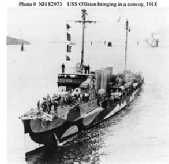 In an article called “Customs of the Navy,” written by Lieutenant Commander A.D. Taylor, C.D., R.C.N. in 1956 and revised in 1961. Commander Taylor said, “In the Sixth Book of the Roman poet Virgil we learn that the old seamen used to place a coin under the heel of each mast to pay the fare to Charon for crossing the River Styx, thereby ensuring a safe passage for all hands over ‘the river of the underworld’ should disaster overtake the vessel. In deference to this old superstition the practice is still carried out. A copper coin inserted in the mouth of a dead seaman in Roman times served the same purpose in respect to the individual.” This told me coins were used by sailors but still did not answer my question why the nickel was stamped in the manner of my find. So my nickel was a coin used in the manner above for the pre-commissioning/commissioning ceremony in 1915 of the USS O’Brien. How many of these were there? Are there more, or is this the sole survivor? I just know it’s a beautiful Buffalo nickel and great collectible.